Already know what you need? Click HERE to SHOP NOW! Before I became a lifestyle blogger, I had a very different career. I was a Registered Veterinary Technician (RVT) for 17 years. I've always had a passion for helping animals and knew one day I'd find a way back into the field, without actually working in a hospital. I'm so happy I've found a way to do just that with Nutritious Pet. Follow over on social media where I'll be sharing pet tips and valuable info to care for your pet. Follow on Facebook here and on Instagram @NutritiousPet. Many of you know "Stella", my French Bulldog, who has been my sidekick on Happy WifeStyle since day one. She is like a child to me and she is such a light in our life....a true member of our family. Stella turned 10 years old this year and people still think she's a puppy when they meet her. I take pride in my knowledge as a veterinary nurse to have been able to take such excellent care of her as she has had special needs throughout her life. She has a megaesophagus which essentially means her esophagus doesn't have the muscle tone that it should to get her food to her stomach. She has to eat smaller meals and get elevated after eating so that gravity takes her food to her stomach so she doesn't regurgitate. Yes, my dog gets "burped". Some people, upon hearing this for the first time, think she must be such a high maintenance dog and would never want that burden. For us....it's become normal and it's actually quite easy. She comes and finds us after she eats because she's so used to being 'held up'. I just think of it as getting to snuggle her a little extra;) I know she came into my life so she didn't end up in a rescue or shelter somewhere. Because of her condition, and because I want the absolute best for her... it's important she eats a high quality food and treats with proper nutritional value. After food recalls on foods I thought I could trust, I've found premium quality foods and treats that are developed by a holistic veterinarian. We now added a new French Bulldog puppy in the family, "Brut" Rosé, and he is loving his food for small and medium breed puppies! He is thriving on it. His coat is absolutely gorgeous, even the breeder we got him from comments how great he looks! I love knowing that he's getting high quality nutrition for healthy development, without corn, wheat, or gluten...or anything artificial. 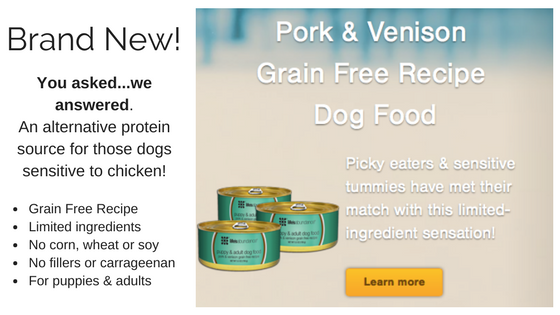 With so many pet foods to choose from today, I know it can be very confusing for pet owners. I started Nutritious Pet because I know what it's like when your dog or cat isn't just a pet.....they're family. I want to share my expertise and hope to help you learn what to look for and what's important to me when I look for a premium pet food. It must be a FIXED FORMULA. This means that the ingredient parameters do not vary. Period. Price and availability of ingredients change day to day and less ethical companies will substitute one ingredient for another to keep costs to a minimum...and not change the label. Yep, that's legal. Just because a label says the ingredients are A, B, and C, there may not be any A, B, or C in the food at all if you're not feeding a fixed formula. This is the reason some pets will do great on one bag of food, so the owner buys the exact same brand again... and the next bag isn't the same. It's because it's not. Read the ingredients. By law, ingredients are listed in descending order by weight of the ingredient added. In other words, the main ingredient is listed first and so on. Pay close attention to those first three ingredients and you'll get a good idea if it's meat based (poultry, meat, lamb, fish) or vegetable based (corn, rice, wheat, soybean). You will pay more for a meat based food. With pet foods, you get what you pay for and pets should be eating a meat based food if you're looking for a quality diet. The higher quality the ingredients, the higher the nutritional value. The higher nutritional value, the less they have to eat of it to get proper nutrition. The less they eat.... the less they poop. Yep, start feeding a higher quality food and you'll notice less waste! Here's my two cents to be a responsible pet owner... our pets have no control over what you choose to feed them. We have an obligation to keep them as healthy as possible and give them the best quality of life we can. Cheap, unfixed formula dog foods with low quality ingredients are poorly digested and lead to health deficiencies. Oh! ...and watch out for the sneaky "ingredient splitting". What a pet manufacturer will do is split an ingredient into its different forms in order for it to look better, and appear lower on the list of ingredients. For example, "ground corn, corn gluten, yellow corn meal, corn gluten meal" It's all CORN and would actually be the main ingredient and should be listed first. Pretty tricky, eh? What makes the food I chose for "Stella" and "Brut" extra special? It's FRESH. This food is shipped directly to the customer. It never sits on a shelf in a store. It's baked in small batches and gets delivered to your pets within 6-8 weeks of being baked. That's incredible compared to how long other bags sit around on shelves. It has a secure zip top bag that keeps it extra fresh...I love that feature. As pet foods sit on store shelves, they lose nutritional value. It's easy because our food is delivered...no heavy lifting or running an extra errand. I enter "Stella's" weight on the website and it calculates how much she eats for her weight, the best size bag to ensure freshness, and how often that size bag will be delivered to my door. I then get an email before it's sent making sure I'm ready, asking if I want to make any changes. I save even more when I 'set it and forget it' with their convenient autoship option. Because this food is sold directly to customers and is not sold in stores.... they put all that money they save on shelf space, marketing and advertising... and put it into the quality of the food. Think for a moment about how much money companies have to pay for those things. Makes sense why many of them are trying to save a buck skimping on ingredients and trying to slide things past us. I love that this company can just concentrate on quality made in the USA ingredients, and transparency. This company has NEVER had a recall on any of their products in 20 years. That's never since the company was started. This got my attention, especially since I've heard about SEVEN pet food recalls in the last two months! I was feeding a very well-known quality food to Stella before finding this one. After their most recent recall, this year, I decided to look further. Here's the thing that struck me about this food... #1 they've never had a recall because they make their food weekly in small batches, in the USA, and have very strict inventory controls and product safety considerations that are second to none. #2 IF they ever did have a recall, they are the only company with an elaborate tracking system that would allow them to notify their customers immediately because their food is shipped directly to the customer. That's the thing about most recalls: #1 the customer never finds out about the recall. #2 they find out too late, after they already fed the food to their pet. Pretty interesting fact to consider, isn't it? When I recently heard about the Pug that died from the recent recall of a pet food that got contaminated with Pentobarbital (which is euthanasia solution), it broke my heart. I knew I had to do more to educate people about this. Click for Dog Food Recalls - is your food on the list? This food is developed by a Holistic Veterinarian, Dr. Jane. This is important to me because after working so closely with excellent veterinarians for almost 20 years, I have respect for their knowledge about what pets need nutritionally. This isn't someone who just wants to make and sell pet food. This is a company with a real woman behind their products that truly cares about bringing the best nutrition to our pets. I've listened to Dr. Jane talk about every detail that goes into making these foods, supplements, and treats. From the ingredients to the kibble size of each formula...it's all for a reason that best benefits the pet. There's a reason behind all of it that makes sense. She even designed the supplements to give our pets additional nutrition because you can only fit so much of each ingredient into a piece of kibble...she created these supplements to enhance and lengthen our pet's lifespan. I know first hand that there is a lot of marketing bologna out there today about what our pets should eat. There are a lot of opinions. There is a lot of hype. There is a lot of "marketing tactics". There is a lot of misinformation. After listening to her talk about why she has developed the foods in the way she has, I trust that I'm feeding Stella and Brut the best food I can and they're getting the correct nutrition for their health. I'll give you two examples that made me confident in this doctor...that she knew her stuff. #1 When I heard her discuss the Weight Loss Food. I know that many weight loss foods are made low fat, with high fiber to help pets feel full, even high quality ones. They aren't designed to keep a pet on for life because they lack enough nutrition to stay on long term. They lose the weight and you switch them over to another food. With this weight loss food, she designed it in a way that's like losing weight "the healthy way". At first, she refused to create a weight loss food for this line because she knew traditional ones weren't healthy for pets and she didn't want to make a low fat, high fiber food. She ended up creating her version of weight loss food with the help of Dr. Barry Sears, creator of the Zone Diet for humans. How many pet foods can say that? It's so nutritionally sound, that a pet can actually stay on it for life without losing optimum nutrition. That got my attention because I realized she was doing things differently...and healthy. #2 I was taught that "All Stage Foods" meant puppy food and was frowned upon in the veterinary community I was in. After hearing Dr. Jane discuss this, I realize this is not the case with this company. She's very aware of how much of each ingredient pets need at different stages in their lives and I loved the different take she had on this. So much of it is indeed hype and marketing. This All Stage food is not 'puppy food'. It truly is an all stage food. The instances she did see a need for, like large breed puppies that need growth rate control, she accounted for some cases with special diets just for them. This company gives back with the Dr. Jane Foundation. This is an organization absolutely committed to supporting a variety of animal rescue groups, all of which are dedicated to helping to rescue neglected and unwanted animals. Every time you purchase a product, a portion of the profits are contributed to a fund that supports the operations of this organization. Together, we can make a positive difference, one animal at a time. "Stella" loves it. Well, this is the most important part, right? I feed her the Grain-Free food and she loves it. She absolutely LOVES the grain-free Turkey Berry Chewies. She can be so picky.... and she's never turned one of these treats down. I also give her the Omega-3 supplement that is the same 5 star, 3rd party tested, superior quality Fish Oil that I take myself....designed especially for pets to support healthy skin, coat, heart, brain eyes and joints. Being an RVT, Nutritious Life Certified, and a Certified Holistic Health Practitioner, I know how important Omega-3's are for anti-inflammatory health. I truly hope this helped you decide on a healthy, nutritious food for your precious members of your family.... your dogs and cats. They deserve it. Need help deciding which products would be best for your pets? Feel free to reach out to me...I'm happy to help give recommendations for your furry friends! They have all products sold individually or in "Healthy Start Packs" in different varieties designed by Dr. Jane... like this one. Remember, NUTRITION, more than any other thing... determines your pet's health. ARE YOU LOOKING FOR AN ADDITIONAL STREAM OF INCOME? If you are a Veterinarian, Veterinary Technician, Assistant, Groomer, Breeder, Trainer, Kennel, Rescue, Dog Walker/Sitter...or just an animal lover... I'd love to talk to you about how to join me in sharing these premium pet products with others. By becoming part of this community and rewarding business, I can help train you to run your own business sharing healthy products for pets, as well as helping rescue pets in need through our foundation if you choose. Contact me today, I look forward to chatting with you. We offer not only premium nutrition through our foods, all of our treats and supplements serve an important purpose to increase the lifespan of our pets. Dr. Jane is a holistic Veterinarian who I've met in person, I've heard speak many times about these products and I'm it's so rewarding to be a part of a business that cares so much about the quality of their products. She is so knowledgable and doesn't compromise when it comes to pet's health. Even the treats in this line of products adds nutritional value for your pet through whole foods. There is a whole line of quality pet products to share with your customers: Dog and cat foods in dry and canned, an array of supplements all with unique purposes so that pets get the best nutrition possible for their needs, shampoos, treats, dental care, chews, ear cleaner, cleaning products that are safe for pets, and the highest quality, third party tested Omega-3 Fish Oil. Doesn't your loved one deserve the best? Attention BREEDERS - We have a "Breeders Program" which is a very unique opportunity for Breeders! If you are a Breeder and/or Kennel, you are eligible for our Breeder/Kennel Program. The breeder program for dogs allows you to earn an income as new puppy parents purchase Life's Abundance food and products from you. You also qualify for special lower pricing! We also have a program for Cat Breeders. Your customers ALREADY entrust their beloved pets to you..........so they will trust you with their pet's nutritional needs. Look at pet products on the shelves today. Many brands contain poor sources of protein such as corn, wheat or byproducts. Then there are artificial flavors and colors and chemical preservatives. Don't forget the environmental hazards our pets are subjected to every day. So it's not hard to understand why good nutrition is critical. As a Pet Professional, we know that pet health is of primary concern to you. We also know that you work very hard and long hours for the love of pets. Your concern for pets and your reputation are of utmost importance. We know that no matter how much money you could make, you would not recommend products you do not believe in. We specialize in a holistic line of premium Pet Products and pet foods that you would be proud to offer your customers. All pet products are formulated by the nationally recognized veterinarian, Dr Jane Bicks. We've recently brought on another holistic veterinarian to the team, Dr. Jessica Vogelsang. I've personally met both of these amazing doctors who care so much about the reputation of this company and this food. We offer a full line of products. Many address problems you see daily such as skin and coat irritations, agility, overweight, etc. Our Life’s Abundance premium health foods for dogs and cats contain very high quality chicken and turkey, pork and venison, pomegranate extract for its powerful antioxidant properties, probiotics and other health promoting ingredients. They contain no by-products, corn, wheat, artificial colors or preservatives. All our products have a full money back guarantee. Life's abundance products will truly make a positive difference in pets’ lives. Life's Abundance is a natural extension of your business. As a representative, you can earn an ongoing income by selling premium products to your customers on our automatic shipment program that customers have the flexibility to change at any time. You can earn even more by getting other Pet Pros involved. NO inventory. Products are delivered right to your customers’ doors. FREE customer service and FREE informed technical staff to assist you. Easy to use Product Sell Sheets to give to your customers, sample bags, and small trial size bags available. Many Pet Professionals who sell our products are also realizing an increase in their current businesses through unsolicited customer referrals. You know, in today’s uncertain economy, many Pet Professionals are seeking a little more financial security. If you don’t go to work tomorrow, you won’t get paid. The ongoing income you can earn can help build that important financial security. This exclusive product line is formulated by Dr. Jane Bicks, a highly respected and nationally recognized holistic veterinarian. Dr. Bicks is the author of three books on pet care and nutrition. She has served on many professional boards. Dr. Bicks was the President of the Veterinary Medical Association of NYC and was appointed by former Mayor Rudolph Giuliani to help start one of the largest animal shelters in the U.S.
Dr. Bicks uses the best of modern science and the best of Mother Nature to formulate our products. It costs only $29.95 (plus tax and shipping) to become a Basic Field Representative. You will receive a Starter Kit that contains everything you need to get started plus a personal web site for one month FREE, which allows your customers to order products and prospects to sign-up into your organization. After the first month there is a $10.95/month charge for your personalized store web site. Statistics show that Executive Field Reps are more successful than basic Field Reps. Becoming an Executive Field Rep is easy. Just choose the Executive Field Representative sign-up option. Your web site becomes your personal store front and training area! The Life's Abundance ® Compensation Plan is very flexible. It was specially designed to compensate distributors at all levels of participation. You work hard and owe it to yourself to be part of a huge and profitable part of the pet industry that pet owners will always need for their pets! If you are ready to expand your pet business Click Here!